Why do a mediocre presentation? A few days ago I got to see a really terrific speaker. He was leading a workshop on implicit bias, and every aspect of his work was precisely chosen, honed, and practiced to support and amplify his message. He committed to a style—he was bold and interesting, and he assumed that his audience was smart. He knew who he was talking to. He connected his material to our interests. I could spend paragraphs on his rhetorical style, how he used words and music, the calculated risks he took with his material. In short, though, it was a master class in how to be intentional in every aspect of your preparation—design, material, and delivery. If you are lucky enough to have a group of people listening to your message, why not make it the best it can be? This is true whether you are thinking about your intention or not. Intention is the engine of our communication with other people; it colors and shapes the words we use, the intonation of our voices, the speed and volume at which we speak, and our body language. I’ll give you an example. You’re in your office, working on something that needs to get done on deadline, and you are finally in the groove of it. A knock comes on the door, and without waiting for an answer, a good buddy sticks their head in and starts talking to you about their weekend plans. What do you do? My guess is that you keep typing, maybe tilt your head slightly toward your friend without actually looking at them, and say “uh huh.” Everything in your body is telling your friend that now is not a good time, and that you are hoping they will pick up on your cues and leave. Your intention is to end the interruption, without dismissing your friend outright. We do this all day, every day. And the more you are aware of your intention, the more control you have over your communication. You can decide that goal isn’t worth going after, and re-purpose that time and energy. You quit the violin. You can reimagine your goal—visualize yourself as first chair of the Boston Philharmonic, and each day you practice gets you a little bit closer. Or you can decide that the practice is itself the goal. That committing to doing something every day is worthwhile in and of itself. But don’t keep slogging along halfheartedly. “To get this over with” is really not a good enough reason to do anything day after day. Here is the great Ira Glass on his conception of The Gap, in a video created by Daniel Sax. You may have noticed that some things are easier to plan to practice than to actually, you know, practice. “I’ve blocked out time on my calendar every day this week to practice my speech!” Easy. “I practiced my presentation every day this week!” Hard. 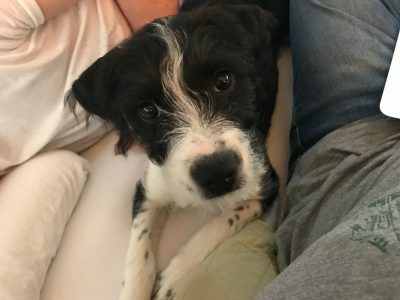 About five weeks ago my family got a puppy—a real, licky, waggy, bitey, pee-on-your-rugs puppy. Her name is Ollie, and she is my brand-new love. Yesterday, we had a session with a puppy trainer. What I didn’t fully realize when we decided to get a puppy was that it’s a lot like having a toddler—you can’t leave them alone, and they make their own rules. Having never had a puppy before, our approach to getting her to learn our rules had been pretty ad hoc. The trainer (also named Angie, oddly enough) asked us a lot of questions, then laid out a precise practice plan to get the results we want, i.e. more of the behavior we love and none of the behavior we don’t. We were excited! A plan! Within four hours of getting home from the visit with the trainer, we had a much clearer understanding of what this plan means. It means stopping what you’re doing every hour on the hour to take Ollie out. It means stopping what you’re doing to correct her behavior with a time-out, then stopping again to get her out of the time-out. It means having a constant mindset of practice—keeping the end goal in mind, while we all (not just the puppy) learn a new way of being. Practice is disruptive. It’s easier and often more comfortable to do the thing you’ve always done. Practicing a new skill can feel like Sisyphus pushing the boulder up the mountain—you get almost there and have to start over. But unlike that doomed Greek man, your practice gets you a few steps closer to your goal every time, even if you can’t tell yet. Not practicing? That’s going to get you a lot of chewed furniture and wet rugs. What? Isn’t that an oxymoron? How can you plan your spontaneity? Good communicators are prepared. They know how they want to affect their audience, and they create something especially for them. As audience members, we know immediately when someone hasn’t prepared for us, right? Unprepared speakers ramble, they go off on tangents, and they talk too long to no apparent end. Sometimes you can actually see the moment when they realize they don’t know what to say next or how to end their talk. It’s like they’ve just walked right off the edge of a cliff, Wile E. Coyote style. But there’s danger on the other end of the spectrum, too. Someone who is over-prepared can seem robotic—they will get through the entire presentation word for word no matter what happens in the room. Or they can seem too polished, too slick. The glorious middle ground is this place of planned spontaneity. You know what you want to say and how. You’ve thought a lot about who you’ll be talking to and how you want them to feel as a result of what you say. And yet, you leave room for something new to occur to you, within the framework of your plan. You know that the most genuine moments can happen when you are able to acknowledge someone in the room, work in a reference to a comment made earlier, or when a brand-new and most perfect analogy or expression surfaces in your mind. Prepare. Then leave room for the magic to happen. Some things are supposed to be difficult. I’m participating in a one-month online course right now, one with mandatory meetings, quick turn-around in-depth assignments, and three to five hours per day of offline work. I applied for it so I could learn new ways of thinking, develop relationships, and most of all, really push the limits of what I think I’m capable of. So why did I find myself thinking this morning, “Maybe the next assignment won’t be too hard”? Isn’t that the point? Didn’t I sign up so that it would be tough, and I’d hit challenges, and I’d have to break through to something brand new? A lot of things don’t need to be hard. Fixing breakfast, choosing an outfit, picking out colors for your house…but somehow we make easy things difficult and then we don’t have the juice left over to tackle the real challenges, the ones that help us grow. In this short video, I’m going to debunk a couple of myths about making eye contact in presentations, and also tell you what we recommend instead! Don’t try to get it right. Why isn’t “to get it right” a good intention? Isn’t it important to get it right? When we’re thinking about needing to get it right, we’re thinking about ourselves. We’re holding onto achievement and getting an A, rather than being willing to be vulnerable, attempt genuine connection, and risk failure. One way to think about this is to reframe what “getting it right” means. Let’s forget “getting all the words in the order I wrote them down,” and “running through all my bullet points.” Instead, what if getting it right means that the people we are talking to walk away feeling changed or motivated or ready to think about something differently? What if they remember your message, not because you said it just how you planned, but because they were moved by who you are? When do you default to your old habits? I’m thinking about this today as I recommit to budgeting, and meal planning, and generally being more intentional. All the tools I need to be good at this stuff are literally at my fingertips—apps, information, lots of ways to monitor and measure. But the driver of all those tools is my intention, my willingness to make it happen. This morning at the gym, I was working on a gymnastics movement that has eluded me for a long time. And today, I was getting it! It was working! I was finally doing the thing that I’ve seen other people do seemingly effortlessly. And then, in the very last minutes of class, it all fell apart. My form got sloppy, my body got tired, and I couldn’t quite finish the last rep.
Couldn’t quite finish the last rep. Man, if that’s not a metaphor for all this other stuff. When it gets hard, what do you do? When you’re tired? When you’re hungry? When does your deliberate, positive intention slip away, leaving you with a sloppy default intention? If we know when we’re likely to throw in the towel, maybe we can strategize how to hold on for that last rep.